This might be of interest to any pedalgeek who never leaves for a gig without a veritable fruit-stand of pedals. If you have a single level pedalboard -- and two rows of pedals -- you've probably hit a control knob out of position by accident. Causing, for instance, a chorus pedal to warble madly out of tune during Message In A Bottle. Or worse -- (insert personal experience here). Those clunky CAT workboots are not exactly pedal friendly. Designed to elevate the upper row of pedals on a pedalboard, the additional height lessens the likelihood of a clumsy boot heel or steel-toe from knocking out a pedal setting on the bottom row. Pedal Risers are made out of 18-gauge steel and attach to the pedalboard with a very heavy-duty hook-and-loop fastener, which according to the company's advertising, is far stronger and more heat-resistant than the Velcro product we've come to know and love. 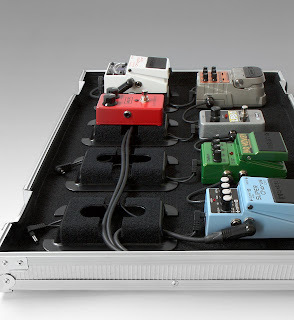 Pedal Risers are modular units -- use one for a single Boss or MXR-type pedal, or two, side-by-side, for larger pedals like the Line 6 Modellers. The space under each Riser also serves to conceal any unsightly wiring for a clean, professional look. My only concern is how much additional weight all that 18-gauge steel is going to add. On a pedalboard it seems like every ounce counts. Hey Clinton, thanks a lot for the great write-up about our product, we appreciate it! Regarding weight, the risers are actually quite light. 18-gauge steel was selected because it possesses a very good balance of strength and light weight. My pleasure and thanks for leaving a comment! It's a great idea. How about a second height riser for pedal-pushers with even more toys?